A BRUTAL fight on a Ryanair plane that saw a passenger’s “nose bitten off” all started because of a woman not wearing shoes, it has been reported. Ryanair said two men were detained after a fight broke out on a UK flight, leaving blood spattered across the cabin. The horror brawl was caught on camera on the Glasgow Prestwick to Tenerife South Ryanair flight. After taking off from Scotland at 6.10am Saturday morning, it all kicked-off at 10,000ft. A 30-second video posted on social media shows cabin crew desperately tried to break up the scrap while passengers could be heard screaming “oh my God”. 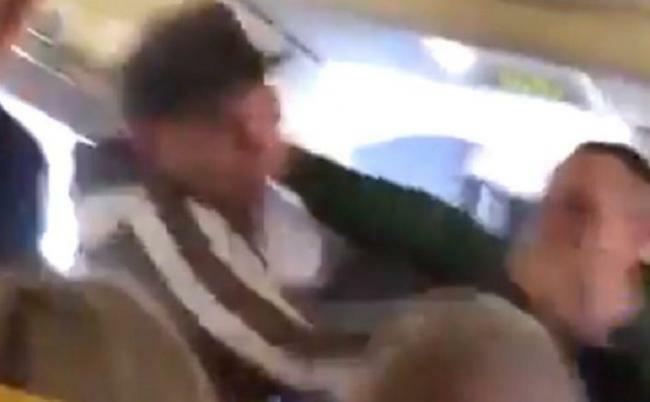 Ben Wardrop, who filmed the incident, said it stemmed from someone taking issue with a fellow passenger boarding the flight without any shoes on. He explained: “It all started over a woman not wearing her shoes on the flight going to the toilet, and a very drunk man pulled her up about it, saying that someone would stand on her toes, then the woman’s boyfriend stepped in and tried to defuse the situation. A picture posted on Twitter appeared to show blood still on the door of an overhead luggage compartment before the plane’s next flight. “There were numerous occasions of drunk and disorderly behaviour leading to a man having his nose bitten off,” a source told the Scottish Sun. A Ryanair spokeswoman said: “The crew of this flight from Glasgow Prestwick to Tenerife requested police assistance upon arrival after two passengers became disruptive in-flight.